Plantar fasciitis is inflammation caused by excessive stretching of the plantar fasciitis.The plantar fascia is a strong fibrous ligament under the sole of the foot that gives the arch of the foot its shape and structure. The plantar fascia is attached to the heel bone (Calcaneous) and supports the arch by acting like a bow string. When this ligament is stretched excessively tiny microscopic tears can appear where the plantar fascia attaches to the bone. 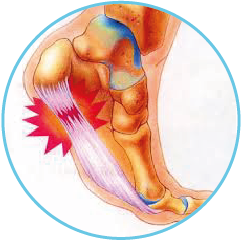 The pain associated with plantar fasciitis often presents as heel pain or arch pain or usually a combination of the two. Patients usually describe pain being worse first thing in the morning or standing after being sat down (1st step pain). The pain can also be described as an electrical pain, which describes the ligament being over stretched and being put under stress. Sometimes the pain will ease once up moving and out and about. In the early stages pain may not be constant and usually occurs following physical activity. However as the condition continues it can become more constant and may start to affect the way you walk. If the condition is left untreated and becomes chronic a secondary problem may occur, and a heel spur can develop. A heel spur is a bony growth that can develop at the point where the plantar fascia attaches to the calcaneal bone, this is the body’s natural response to the excessive forces being placed on the arch of the foot as it attempts to prevent the ligament from detaching from the bone. Plantar fasciitis can occur in anyone, the most common cause being excessive force and overloading of the plantar fascia ligament. This over stressing of the plantar fascia can be the result of the following. Unstable or unsupportive inappropriate footwear. People who have recently increased their levels of physical activity. People who have to stand for long periods of time, e,g shop workers. People who have flat feet (over pronation). At Stockport Chiropody Clinic their are various treatments available that can be recommended. Plantar fasciitis is generally the result of faulty biomechanics or poor foot function. The aim of treatment is to prevent excessive stretching (elongating) of the plantar fascia ligament. This is one of the first methods in treating plantar fasciitis. A heel cushion made out of grey medical grade 6mm Poron can be made for the affected heel. This works by cushioning and reducing the pressure and can give some level of protection with shock absorption as the foot/heel hits the ground when walking, which is where most of the pain of plantar fasciitis is felt. Silicone or heel raises can lift the heel slightly, giving the foot a more natural arch and thus reduce thee tension felt in the arch area. These are available in clinic or can be custom made and fitted in the clinic. Incorrect or inappropriate non supportive poorly fitting shoes/footwear can make the symptoms of plantar fasciitis worse. It is imperative that good footwear is worn if suffering from plantar fasciitis. Footwear advice is subjective but mainly consists of recommending good supportive quality shoes or boots and often a small heel is of benefit as it raises the arch and reduces tension of the fascia ligament. Boots are also great in reducing foot pain, as they increase ankle support and improve foot function. The clinician at Stockport Chiropody Clinic will offer advice and give a footwear assessment where necessary. The most successful treatment for plantar fasciitis is by realigning the biomechanical structures of the foot using orthotics. Orthoses will be recommended by the podiatrist only if they feel that the patient will benefit from such a device. If the foot is over pronating (flattening) when weight bearing this will be contributing to the painful symptoms. In these cases orthotics should be prescribed and fitted as they are specifically designed to control excessive subtalar joint pronation (poor foot function) the aim being to assist and prevent over stretching or excessive stress on the plantar fascia ligament. Orthotics are a fantastic method in relieving painful symptoms and discomfort, they can also prevent the condition from deteriorating further, and generally improve lower limb function.